Conscription in the United Kingdom has existed for two periods in modern times. The first was from 1916 to 1920, the second from 1939 to 1960, with the last conscripted soldiers leaving the service in 1963. Known as Military Service from 1916 to 1920, the system of conscription from 1939 to 1960 was called National Service, but between 1939 and 1948, it was often referred to as "war service" in documents relating to National Insurance and pension provision. Conscription during the First World War began when the British government passed the Military Service Act in January 1916. The act specified that single men aged 18 to 40 years old were liable to be called up for military service unless they were widowed with children or ministers of a religion. There was a system of Military Service Tribunals to adjudicate upon claims for exemption upon the grounds of performing civilian work of national importance, domestic hardship, health, and conscientious objection. The law went through several changes before the war ended. Married men were exempt in the original Act, although this was changed in June 1916. The age limit was also eventually raised to 51 years old. Recognition of work of national importance also diminished, and in the last year of the war there was some support for the conscription of clergy. Conscription lasted until mid-1919. Due to the political situation in Ireland, conscription was never applied there; only in England, Scotland and Wales. Conscription legislation lapsed in 1920. However, as a result of the deteriorating international situation and the rise of Nazi Germany, Leslie Hore-Belisha, Secretary of State for War, persuaded the cabinet of Neville Chamberlain to introduce a limited form of conscription on 27 April 1939, with the Military Training Act being passed the following month. Only single men 20 to 22 years old were liable to be called up, and they were to be known as "militiamen" to distinguish them from the regular army. To emphasise this distinction, each man was issued with a suit in addition to a uniform. The intention was for the first intake to undergo six months of basic training before being discharged into an active reserve. They would then be recalled for short training periods and attend an annual camp. At the outbreak of war, on 3 September 1939, the Military Training Act was overtaken by the National Service (Armed Forces) Act, and the first intake was absorbed into the army. This act imposed a liability to conscription of all men 18 to 41 years old. Men could be rejected for medical reasons, and those engaged in vital industries or occupations were "reserved" at a particular age beyond which no one in that job would be enlisted. For example, lighthouse keepers were "reserved" at 18 years old. From 1943, some conscripts were directed into the British coal mining industry and become known as the "Bevin Boys". Provision was also made for conscientious objectors, who were required to justify their position to a tribunal, with power to allocate the applicant to one of three categories: unconditional exemption; exemption conditional upon performing specified civilian work (frequently farming, forestry or menial hospital work); exemption from only combatant service, meaning that the objector had to serve in the specially created Non-Combatant Corps or in some other non-combatant unit such as the Royal Army Medical Corps. Women who had one or more children 14 years old or younger living with them. This included their own children, legitimate or illegitimate, stepchildren, and adopted children, as long as the child was adopted before 18 December 1941. Pregnant women were not exempted, but in practice were not called up. Men under 20 years old were initially not liable to be sent overseas, but this exemption was lifted by 1942. People called up before they were 51 years old but who reached their 51st birthday during their service were liable to serve until the end of the war. People who had retired, resigned or been dismissed from the forces before the war were liable to be called back if they had not reached 51 years of age. Britain did not completely demobilise in 1945, as conscription continued after the war. Those already in the armed forces were given a release class determined by length of service and age. In practice, releases began in June 1945, and the last of the wartime conscripts had been released by 1949. However, urgently needed men, particularly those in the building trades, were released in 1945, although some restrictions on their immediate employment were supposed to be enforced. All women were released at the end of the war. National Service as peacetime conscription was formulated by the National Service Act 1948. From 1 January 1949, healthy males 17 to 21 years old were expected to serve in the armed forces for 18 months, and remain on the reserve list for four years. They could be recalled to their units for up to 20 days for no more than three occasions during these four years. Men were exempt from National Service if they worked in one of the three "essential services": coal mining, farming and the merchant navy for a period of eight years. If they quit early, they were subject to being called up. Exemption continued for conscientious objectors, with the same tribunal system and categories. In October 1950, in response to the British involvement in the Korean War, the service period was extended to two years; in compensation, the reserve period was reduced by six months. National Servicemen who showed promise could be commissioned as officers. 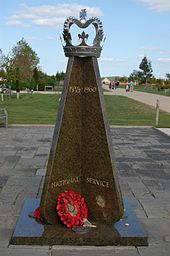 National Service personnel were used in combat operations, including the Malayan Emergency, the Cyprus Emergency, in Kenya against the Mau Mau Uprising, and the Korean War, where conscripts to the Gloucestershire Regiment took part in the last stand during the Battle of the Imjin River. In addition, National Servicemen served in the Suez Crisis in 1956. During the 1950s there was a prohibition on serving members of the armed forces standing for election to parliament. A few National Servicemen stood for election in the 1951 and 1955 general elections in order to be dismissed from service. National Service ended gradually from 1957. It was decided that those born on or after 1 October 1939 would not be required, but conscription continued for those born earlier whose call-up had been delayed for any reason. In November 1960 the last men entered service, as call-ups formally ended on 31 December 1960, and the last National Servicemen left the armed forces in May 1963. Bermuda Regiment recruits clean their Ruger Mini-14/20GB rifles prior to a shoot at Warwick Camp during the 1994 Recruit Camp. Currently, the British overseas territory of Bermuda practises conscription. Recruitment into the part-time military reserves in Bermuda (from 1895; service in the old Bermuda Militia, as in that in England and Wales, had been compulsory for all able-bodied, military-aged males) had originally followed the practices in England for the militia, in which soldiers voluntarily enlisted for six years, and in the later Volunteer Force, in which part-time soldiers served voluntarily and could quit their service with 14 days' notice, except while embodied for training, war, or national emergency. The Militia, Volunteer force, and Yeomanry were merged into the Territorial Force (later renamed the Territorial Army) in Britain in 1907, with the introduction of terms of service (specific lengths of service for which volunteers enlisted), but this did not occur in Bermuda until the 1920s. Conscription into the Bermuda Militia Artillery and the Bermuda Volunteer Rifle Corps was discussed during the First World War, but had not been put into place before the cessation of hostilities. It was introduced during the Second World War, with conscripts serving full-time for the duration in the BMA, BVRC, the Bermuda Volunteer Engineers, or the Bermuda Militia Infantry. Those unable to serve full-time were directed into the Bermuda Home Guard. Although conscription ended with the war, a shortfall of volunteers led to its reintroduction to the BVRC in 1957 and the BMA in 1960. Since the two units were amalgamated in 1965, conscription has been retained, making the Bermuda Regiment the only conscripted force still serving under the British Crown. Conscription is for three years of part-time service, with the terms of service otherwise identical to those which originally applied to Territorial soldiers in Britain (with a basic service requirement of one drill night per week, one weekend camp per month, and one two-week annual camp per year, not including embodiment for active service. Service is for home defence purposes, and soldiers cannot be compelled to serve in overseas campaigns). In 2015 Prince Harry made a call for bringing back conscription. Following the launch of his 2009 film Harry Brown, English actor Michael Caine called for the reintroduction of national service in the UK to give young people "a sense of belonging rather than a sense of violence". Queen and Country (2014) Character undergoes National Service training prior to Korean War. Privates (2013) Mini-series about soldiers at an Army base. Father Brown, Series 3, The Sign of the Broken Sword. (2013) Crime-drama set on a 1950s Army base. Bad Lads Army (2002–2006) Reality TV series. The Krays (1990) Barrack room scene. Stand Up, Virgin Soldiers (1977) Based on the novel of the same name. Get Some In (1975–1978) TV sitcom set in an RAF base. The Virgin Soldiers (1969) Based on the novel of the same name. Idol on Parade (1959) Character undergoes two years National Service. Carry On Sergeant (1958) Comedy. The Army Game (1957–1961) TV sitcom contemporary with National Service. Down Among the Z Men (1952) Featuring The Goon Show comics. Monty Python's Flying Circus (1970) The Piranha Brothers were said to be "found by an Army Board to be too unstable even for National Service." Baxter, D; Two Years to Do, 1954. – Memoir. Camp, W; Idol on Parade, 1958. Fiction. Ions, E; Call to Arms: Interlude with the Military, 1972. – Memoir. Lodge, D; Ginger, You're Barmy, 1962. – Fiction. Thomas, L; The Virgin Soldiers, 1966. – Fiction. Thomas, L; Stand Up, Virgin Soldiers, 1975. Fiction. Weston, P; A Stranger to Khaki: Memoir of a National Service Officer, 1997. ^ Simkin, John (August 2014). "Conscription". Spartacus Educational. ^ Ministerial statement reported in The Times, Thursday, 18 April 1957; pg. 4; Issue 53819; col E "Defense Policy Approved/ Conscription To End With 1939 Class"
^ "www.NSRAFA.org – Get Some In". www.nsrafa.org. Archived from the original on 17 June 2018. Retrieved 30 August 2018. ^ Imperial War Museum. "What was National Service?". archive.iwm.org.UK. Archived from the original on 12 January 2015. Retrieved 4 April 2013. ^ "Harry the happy warrior: Bring back national service, says Prince". dailymail.co.uk. ^ Harley, Nicola (16 May 2015). "Prince Harry calls to bring back National Service". ISSN 0307-1235. Retrieved 30 August 2018. ^ "Prince Harry wants you to join the army". news.com.au. ^ "Put Young People In The Army, Says Caine". 29 September 2013. Retrieved 14 February 2018. Broad, R; Conscription in Britain 1939–64, 2006. Broad, R; The Radical General: Sir Robert Adam and Britain's New Model Army, 2013. Carradice, P; The Call Up,2016. Chambers, P; (ed), Called Up, 1955. Coates, B; National Service Fifty Years On,2014. Doyle, P; National Service, 2012. Hickman, T; The Call Up: A History of National Service 1947–1963, 2004. Johnson, B.S; All Bull: The National Servicemen, 1973. McCutcheon, C; (ed), The National Serviceman's Handbook, 2007. Pollard, R; You and the Call Up, 1942. Royle, T; National Service: The Best Years of Their Lives, 2002. Shindler, C; National Service, 2012. Thorne, T; Brasso, Blanco and Bull, 2012.